Don’t forget guys! Wildside returns this Saturday for a massive special ‘club night only’ with guest DJ ‘Lady Wildside’ Kuli! You can find the Facebook event page by clicking HERE so let us know if you are coming and if you have any requests for the DJs! 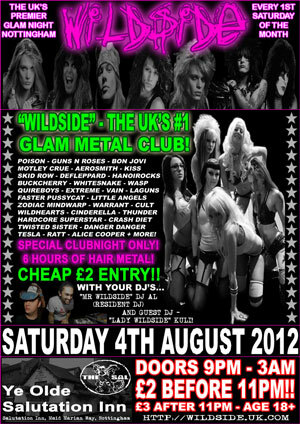 WILDSIDE IS BACK! AND WE RETURN ON THE 1ST SATURDAY IN AUGUST WITH ANOTHER SPECIAL CLUBNIGHT ONLY!! Entry is just £2 before 11pm! Plus we have a guest DJ “Lady Wildside” himself… Kuli! As typical he will be bringing a different take on things and playing Wildside tunes not normally heard and a little off the wall! Of course DJ Al will be there as always! Get there early to hear more rare stuff before the main clubnight gets into full swing! GLAM – SLEAZE – HAIR METAL – HARD ROCK (and just the odd bit of AOR!!!) ONLY ALL NIGHT!! With DJ Al Wildside himself, and GUEST DJ “Lady Wildside” Kuli! Free entry all night – DJ Johnny Fangz playing a mix of rock and metal! With the WILDSIDE GIRLZ podium dancers! !